Off-the-shelf bug-out bags are okay– they’re definitely better than nothing! But they are almost all lacking, in terms of the items they have, and the quality of those items. On top of that, you certainly pay for the convenience of being able to buy a BOB that has been put together for you, rather than having to invest your time into researching everything yourself. But building your own BOB can save you money, it can give you the confidence of knowing you’ll be well equipped in a disaster or emergency, and it can even be fun! We aim to help guide you, as you construct your own bug-out bag, so that you don’t leave out any necessities, so that you stock your BOB with quality items, and so that you get the most bang for your buck. When making a BOB, there is often debate on which you do first– find a bag, or buy your gear. Here at Ultimate Bug-Out Bag List, there is no debate– buy your gear first! You don’t buy a bag, and then fit what you can in it, you buy everything you will need to survive and thrive as well as possible, and then you find the bag to contain it. Water is perhaps the single most important item in a BOB. You can go without food for three days, but you can’t go without water for three days. Off-the-shelf BOBs rarely, if ever, have enough water. One thing to be careful of, when it comes to water, is having dehydrated food in your bag. Dehydrated food requires water, that most likely will come from your drinking supply. This is why we recommend you do not put dehydrated food in your BOB. Typically, BOBs are designed to sustain a person for 72 hours (3 days). However, we at Ultimate Bug-Out Bag List feel that 72 hours is not long enough. We feel that you should have everything you need for the first 72 hours, in your BOB. But you should also have the necessary tools and equipment to go weeks, and possibly even months beyond the 72 hour period. This is why we strongly recommend you have some type of water filter, so that you can get drinkable water from just about any water source you come upon. Water purification tablets can also extend the time that you can survive in a disaster. Water in Bottles, Bags, Cans, Etc. Food is very important, because food gives you energy. Often in a disaster situation, be it in the aftermath of a hurricane, tornado, earthquake, or even terrorist attack, you will need to be able to clear rubble, build shelters, travel long distances on foot, and may other physically exhausting things. To be able to do these things, you need food so that you have energy. We recommend high calorie foods that are specifically intended to be used in emergencies. These foods are usually designed to have a long shelf life, and to provide a high number of calories per pound. As mentioned under the Water category, avoid foods that are dehydrated; they sound very tasty, but they require you to use water from your drinking supply to make them. If you find that your BOB needs more food, but you don’t want to spend much money, toss in a jar of peanut butter. As with all food in your BOB, check the expiration date! In a survival situation, mental health is as important as physical health. When you’re surviving under harsh circumstances, hot food, or hot tea or coffee can really lift your spirits. There are many small, light stoves that use alcohol or fuel tablets, that won’t take up much room in your bag or weigh you down, but will let you have access to hot foods and beverages. They also allow you to boil water (assuming that you have a pot or something to boil it in), so that you can safely drink any water you might come upon. But they still do take up space and add weight, so you’ll have to decide if it’s worth taking one. If you plan to cook on a portable stove, or even on a campfire, you’ll need utensils to cook with. Small metal pots and/or canisters are great to cook food and boil water in. You also might need eating utensils, unless your food is in bar form. A small can opener can come in handy, and if any of your food is canned, it is a necessity. Note: If your BOB is stocked with dehydrated food, you will need a portable stove, or some other method, to boil water for your food. A light source is very important to have. Disasters don’t always strike at the most convenient times. Trying to evacuate or move at night, or in dark places, can be very hazardous, and can cause injuries that can compound your problems. This is why it is very important to have a good, reliable light source. It should be shockproof, waterproof, and it should last a long time with good batteries. Obviously, if your light source uses batteries, you should have good batteries. As with food, check the expiration dates! Additionally, you might want a light source that doesn’t use batteries at all. There a number of good light sources that are cranked by hand, meaning that you are not reliant at all on batteries. In addition, glow sticks can be very useful, both for helping you see, as well as letting other people see where you are in the dark. It is important that you can start a fire, if you need to. For starting fires, we recommend that you have a number of tools in your BOB. First, we recommend you have a lighter and waterproof matches. These can be used to get a fire going quickly. But we also recommend having a fire starter. These are often rods or pieces of ferrocerium or a similar material (often with magnesium mixed in), and a metal striker. When the striker hits the rod, it gives off a shower of hot sparks, which will ignite tinder. The great thing about these is that they are usually good for thousands of uses, and they are usually sturdier than lighters. Be careful with one handed fire starters, however; though they are great if you are injured or exhausted, they tend to not be quite as rugged as the two handed ones, and can break. It is very common for injuries to occur during disasters, or even immediately after disasters, when there may be a lot of wreckage and debris. It can be tough to survive when you’re healthy– being injured makes it much, much harder. In addition, you can’t afford to let a cut, bite, or scratch become infected while you’re in a survival situation. This is why it is extremely important to have a good first aid kit in your BOB. Many off the shelf BOBs have little more than band-aids and bandages. A good first aid kit will have bandages, but it will also have things to clean wounds, treat snakebites, treat fever and pain, treat burns, and more. It should also have a small pair of scissors, tweezers, and razor blades. 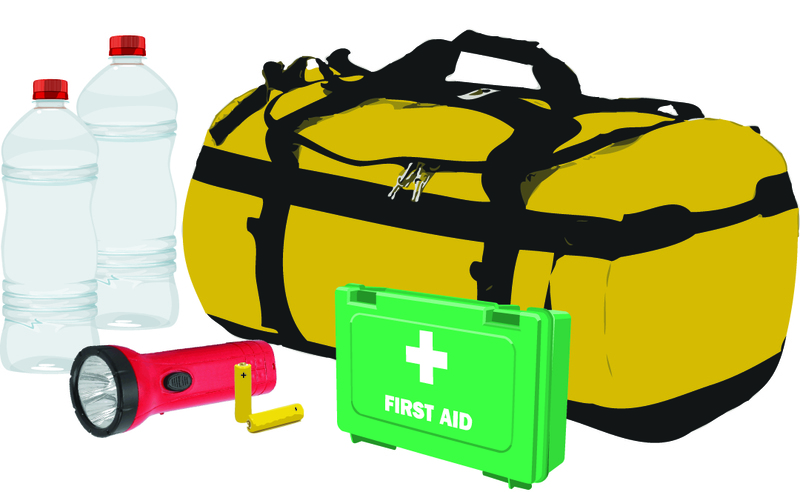 It isn’t enough to just have a good first aid kit, you need to know how to use it. You’d don’t want to be trying to read through a pamphlet or guide as you try to figure out how to treat yourself, after a disaster. Something that can’t be overlooked when it comes to surviving after a disaster is sanitation. It is very important that you use good sanitation habits, to prevent spreading bacteria that can cause sickness and infections. But it’s also important that you have the right gear. After a disaster or terrorist attack, there could be all sorts of things that are very dangerous to you. These types of hazards range from viruses and bacteria from infected people, to exposure to chemicals, and potentially even nuclear fallout. This is why we recommend rubber gloves, NIOSH-approved N95 masks, garbage bags, and if possible, gas masks. For personal sanitation, toilet paper, tissues, hand sanitizer, and feminine napkins are important. One of the first things you’re going to want to do in the event of a disaster is, after getting to a safe area, make a shelter. A shelter can be made by using a knife, machete, hatchet or other tool to cut branches and saplings to build a lean-to or bivouac, but it’s best if you have some type of shelter in your bob. Even a simple tube tent be of great help, if you can’t afford the weight or space of a slightly more substantial tent. You can also have items to help you make a shelter quickly. Tarps are great for quickly building shelters, and rope or paracord (also called 550 cord), as well as string and duct tape all essential to getting a solid shelter up quickly. A good knife can be extremely useful when in a survival situation. It can be used for defense, to build a shelter, and countless other things. We recommend a fixed blade knife, and in particular, one with a full tang. A full tang means that the blade extends all the way through to the end of the handle. Knifes with full tangs are usually much stronger than knives with partial tangs. And when you’re in a survival situation, you will be requiring a lot from your knife. You may need to cut through branches or small trees, you may need to do some batoning, or even possibly prying (it’s always better to have a crowbar or other tool made for prying than to use your knife). Folding knives can be very handy, as they’re usually smaller and lighter than fixed blade knives. But they often aren’t as durable as fixed blade knives, and sometimes aren’t as versatile. If you do decide to go with a folding knife, we recommend that you go with a lock blade knife. And a knife usually isn’t a good thing to skimp on, if you can help it. When it comes to tools, there are many, many things that would make life easier in a survival situation. The problem is, in a survival situation, you can’t be weighed down too much by your gear. There are a number of tools that we recommend you put in your BOB. A small crowbar (not the long heavy kind often found in people’s garages) can be very useful. A multi-tool can be a life saver, and there are many, many situations in which having one can really help you out. An entrenching tool is fairly small and compact, and is great for digging latrines. A hatchet and a machete can be very useful as well, but you’ll have to decide if they’re worth the weight and space to carry them. Something often overlooked when it comes to bug-out bags is clothing. Most BOBs will have heavy working gloves, as well as all weather ponchos. Those are absolutely necessary. But there’s a lot more that is needed. You never know when you’ll need your BOB, so it’s best to have some warm clothes with your BOB. Clothes can take up a lot of space, so if there isn’t room in your BOB, keep another, smaller backpack with your clothes in it, next to your BOB. At the very least, you’ll need some good, durable pants, a heavy shirt, some underwear, and some heavy socks. You might also like to have a heavy coat, a good pair of boots or shoes, and a balaclava or knit cap. And some type of hat to keep the sun off your face and neck can be very nice to have. Communications are very important. At the very least, you will want a radio with AM and FM, in order to get information and possible instructions. A radio with shortwave is even better. 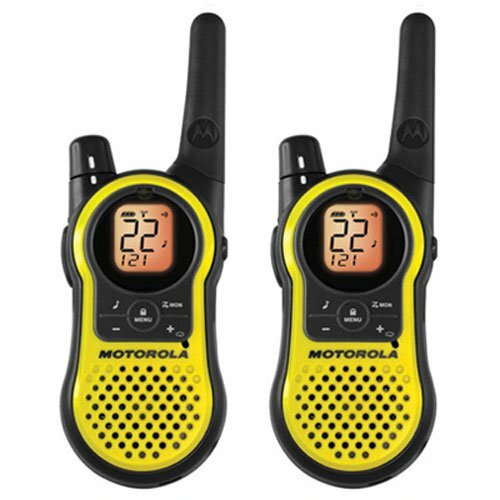 If you’re with one or more other people, walkie-talkies can allow you to stay in constant communication, even when you’re not in each other’s immediate area (normally you would not want to separate, however). As always, have good batteries, and check the expiration date on the batteries. You should also have a signal mirror and whistle so that you can signal for help. Often after disasters, you shelter in place until help can arrive. There may be times, however, when you have to leave the area. For this reason, it’s always good to have tools to help you navigate. A compass and a map can be extremely helpful, especially in rural areas, but also in urban areas. A GPS (make sure you have good batteries!) can let you know exactly where you are, and can help you get to a specific location, if you need to. 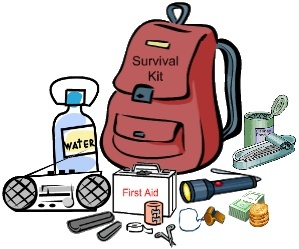 There are a number of other things that can be vital to have in your bug-out bag. Make sure you have a roll of duct tape, a needle and thread, insect repellent (you don’t want to be eaten alive by insects! ), and a pen and paper for leaving notes to let people know where you went. Sunscreen is important so that you don’t get sunburned, as a bad sunburn can leave you in intense pain and with very little energy or motivation. Weapon Such as Gun, Taser, Pepper Spray, Etc. And finally, you need a bag to put everything in! The bag is just as important as everything you put in it. Your bag should be big enough to hold everything that you need, it should be sturdy and well made, and it should be very comfortable to carry. We always recommend a large, heavy duty backpack (unless you’re making your BOB for your car, in which case a smaller bag will do). It’s important the backpack sits comfortably, and distributes it’s weight well, so that it does not cause any pain or discomfort at all. The straps should be thick enough to not cut in to your shoulders, and good backpacks often have a bit of padding where the pack sits up against your back. Pockets and pouches can be very nice to have, but make sure they close securely and don’t come open easily, when they’re not supposed to. Your backpack should be waterproof if possible, or water resistant, at the very least. 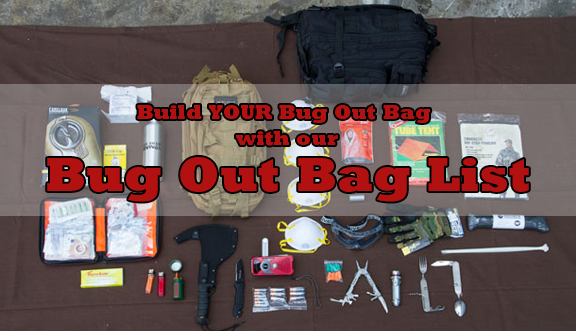 We hope this bug-out bag list helps you make a bug-out bag you can have confidence in. Very soon, we will be recommending specific items for each of the categories address above. Below are the lists of Essential, Strongly Recommended, and Optional gear, all together, so that you can browser through them more easily.